Poison hemlock (Conium maculatum) is among the most deadly plants in North America. This non-native invasive weed contains highly toxic piperidine alkaloid compounds, including coniine and gamma-coniceine, which cause respiratory failure and death when ingested by mammals. The roots are more toxic than the leaves and stems; however, all parts of the plant including the seeds should be considered dangerous. It is a common misconception that poison hemlock sap will cause skin rashes and blisters. In fact, poison hemlock toxins must be ingested or enter through the eyes, cuts, or other openings to cause poisoning. Poison hemlock is a biennial weed. It spends the first year as a basal rosette and the second year as an erect, towering flowering plant that can measure 6-10' tall. Despite its common name, poison hemlock is not a tree; it is a member of the carrot family, Apiaceae (formerly Umbelliferae). 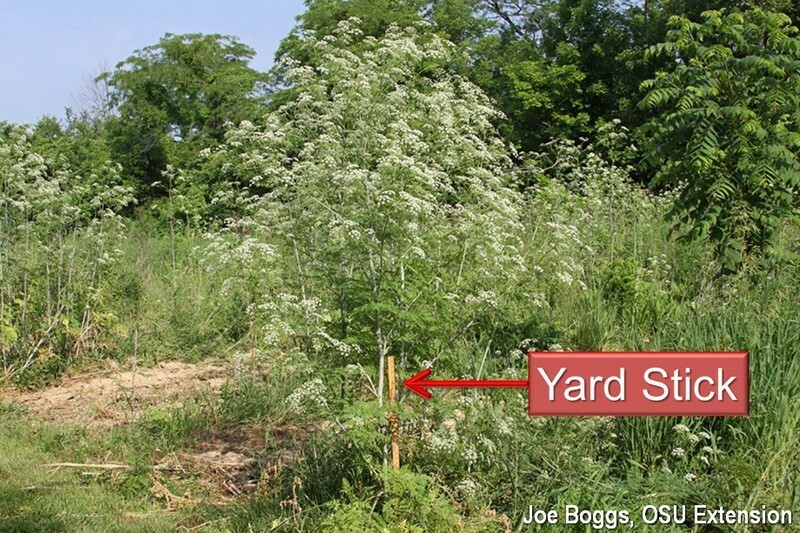 Thus, it shares many characteristics with other members of the carrot family found growing in Ohio including non-natives such as QUEEN ANNE'S LACE (Daucus carota) and WILD PARSNIP (Pastinaca sativa). Wild parsnip is notorious for containing sap loaded with furanocoumarins that produce a light-linked condition called phytophotodermatitis in humans and livestock. If plant juices contact skin and the skin is then exposed to sunlight (specifically ultraviolet light), severe blistering can occur, as well as skin discoloration that may last several months.